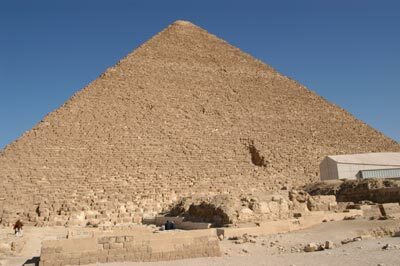 The largest of the pyramids on the plateau is that of Khufu (Cheops) -- a stone monument that is one of the seven wonders of the Ancient World...or just The World, I guess. Very little since has rivalled the monumental effort to built these stone giants. 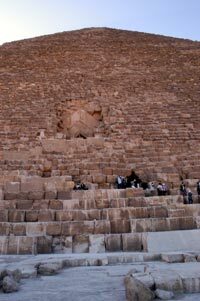 Nothing prepared me for the sheer size of the pyramid -- it was originally 140 m high and 230 m square. Some of the blocks are nearly as tall as I am. No one is entirely sure how the pyramids were built (although the myth that they were built by slaves is just that, a myth). We get that myth from Herodotus (a greek historian) who said that the pyramid took 30 years and the labor of 100,000 slaves. Howver, this is unlikely -- the current estimate is that it was built by peasants during the annual Nile Flood and that they were paid in food for their work. 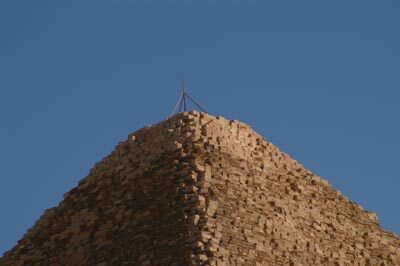 The owner of this pyramid, Cheops, is a bit of a mystery. HIs tomb was completely looted and the only image of him is a tiny tiny statue that was found near the pyramid (its now in the Egyptian Museum in Cairo). 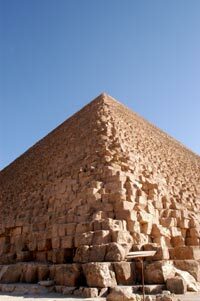 There are roughly 2.3 millioni blocks of stone in the pyramid, which weigh about 6 million tons. No wonder I felt a bit claustrophobic in there! It is built of limestone blocks and was clad in white tura limestone. It has been stolen, eroded, or simply collapsed, which has shrunk the pyramid about 33 feet in all directions.